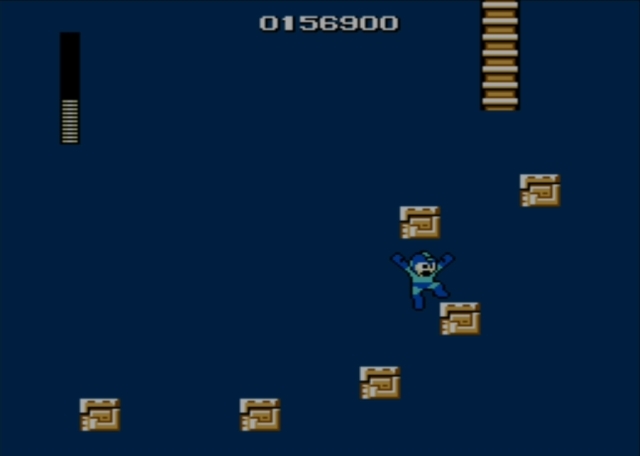 You shouldn't attempt this stage until you have gain Guts Man's ability. 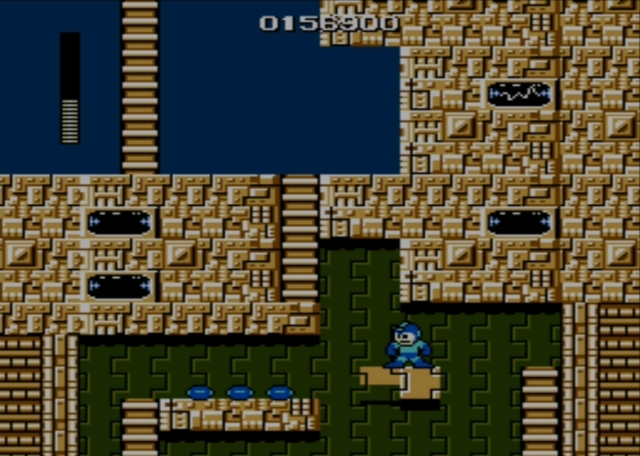 That will allow you to clear away three large blocks partway through the stage and reach an important, somewhat easily missed power-up that you'll need later in the game. 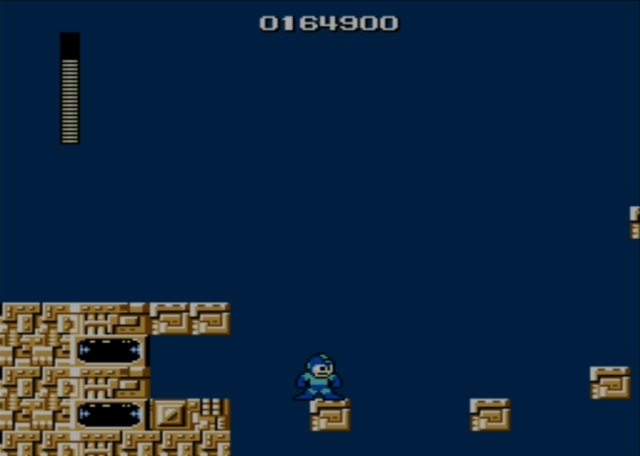 Until you get the hang of things, it can be surprisingly easy to die in the very first screen of this level, even though it looks like it shouldn't pose much of a risk. The setup is like so: there are four ledges you need to ascend to reach the ladder on the room's upper right side. 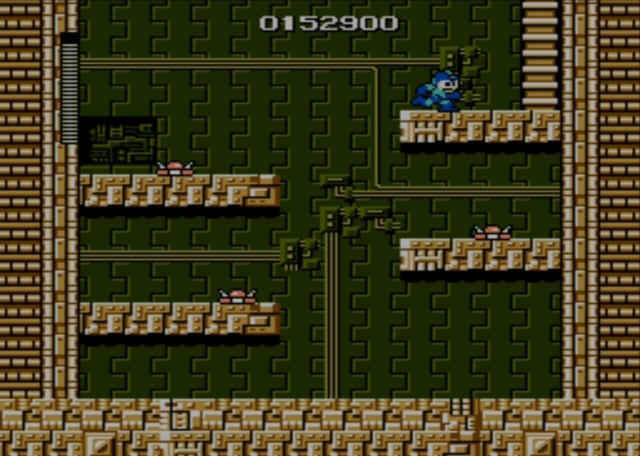 Short, armored enemies patrol the first three of those ledges, and they race toward you if you land on their level. You can blast them to freeze them in place for a short duration, and then you should blast the next one and hop to its ledge before blasting one to the upper left and hopping to its position. The whole endeavor falls quickly apart if you don't have the timing just right. 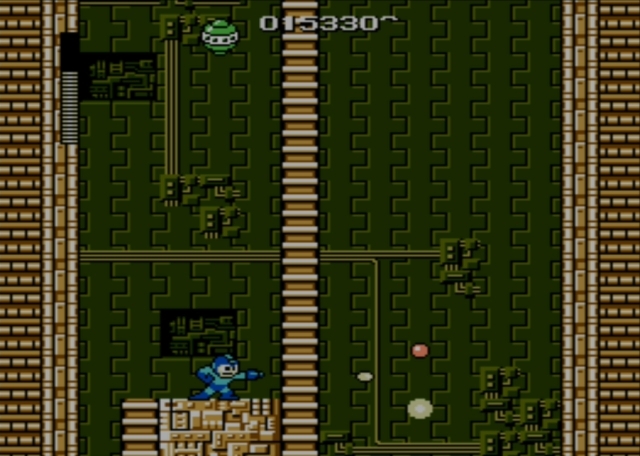 Blast a robot too near the edge of a platform, for instance, and you can't safely leap to that platform. Or potentially even worse, you'll take damage and drop back down anyway. Be patient and get used to the process. You should be able to get to the next screen, with practice. There are more of the patrolling enemies here, and you once again need to freeze them when they are in the right position, but you don't have to worry about so many tricky jumps because there's plenty of head room. 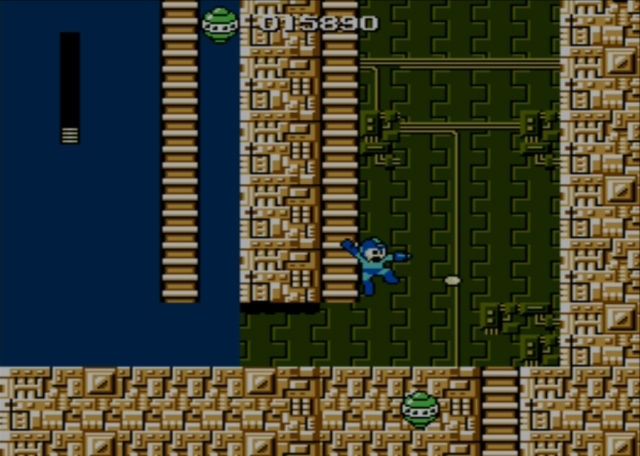 Blast the robots and freeze them, then hop quickly up to the platform with the ladder and ascend said ladder to the next room. See the blocks with blue dots that look like eyes? Those are electrical conductors, and they'll seen electricity flying from their sides. In this case, that means dangerous energy currents to the right. You have to wait for that electricity to dissipate and then you must quickly leap up the ledges and climb the ladder to the left. At first, it seems like this room is empty. However, green pods will come from the top and bottom of the screen. As they come even with you, they fire electrical charges to their sides. 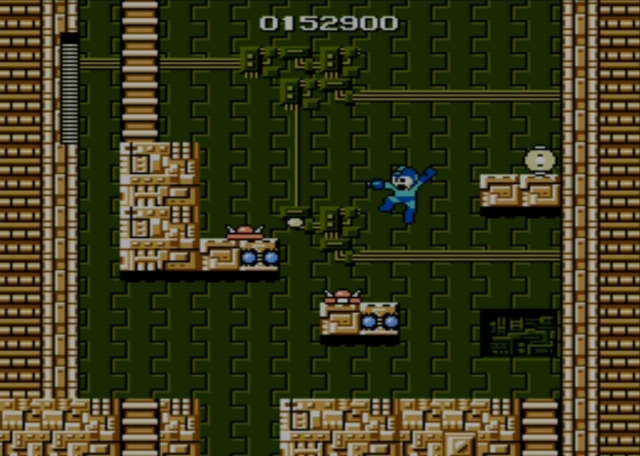 You want to move right so you're almost even with the ladder at the middle of the screen, while firing shots to the right to take out any of the pods ascending from the bottom of the screen. Then look left and quickly blast any of those pods as they drop almost to your level. Only then is it safe to climb the ladder into the next screen. Drop onto the ledge to the left and repeat the process, then climb up one more screen. 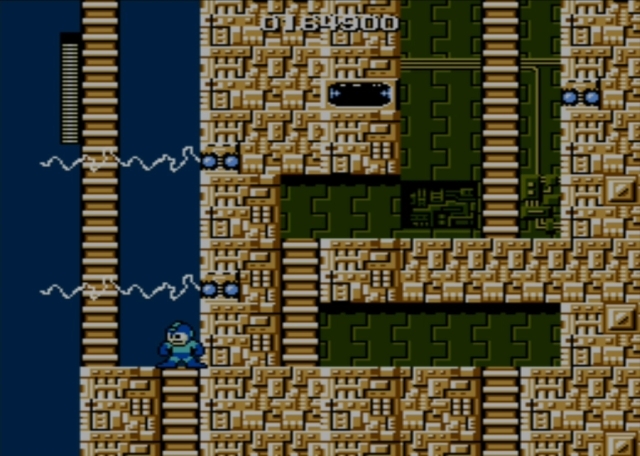 Here, there is a new obstacle: the disappearing/reappearing blocks that have made an appearance in every Mega Man adventure to follow (at least, as far as I can recall). In this screen, they aren't so bad. Hop to the low block, then hop straight upward again as a block appears under you. Wait until it is just about to appear and make a leap to the upper right, where a block should appear just under your feet if your timing was right. From there, leap to the ladder. Do note that all of this will take some practice to get right, so you should start by watching the order in which the blocks appear to get a feel for their duration, placement, timing, and order. 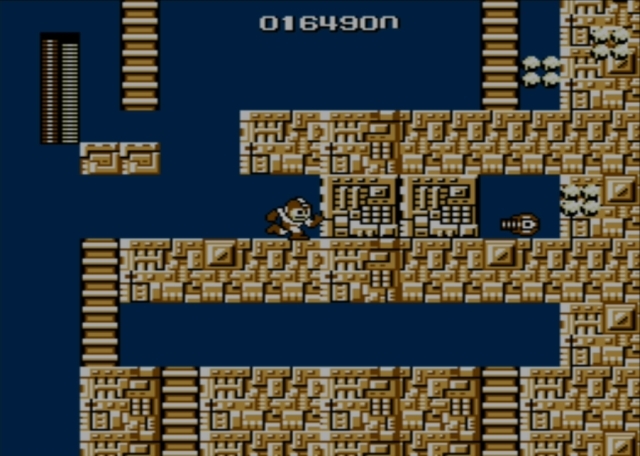 Once you ascend the right of the two ladders into the next screen, you'll be able to ascend to another ledge, where a series of four more disappearing/reappearing blocks await. Their order of appearance is a bit simpler, and you can cross carefully along them and then leap to the upper left to find solid ground. Then climb the ladder. Make your way right along this next ledge, and then leap along a series of blocks suspended over an abyss. Climb the ladder that waits on their far side. This screen brings back the green pods that rise form the top and bottom of the screen, so don't let them catch you unawares. When they're tended to, you can climb either the left or right ladder. The right route seems to be the simpler of the two, so that's the one I'll outline here. Ascend to the next room and you'll see more of the electrical conductors that send out waves of energy. By now, you should have sufficient practice that avoiding them comes naturally. The trick is to stand at the base of a ladder. Wait for the energy to vanish overhead, then jump straight up to the top of the ladder, rather than climbing. Run left and start climbing so you're halfway between the bottom and top transistor. Let the energy appear again. If you are positioned properly, it will pass above and below you. 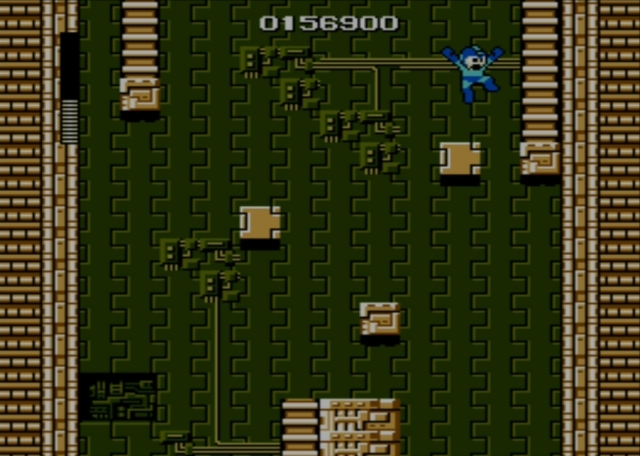 Then you can climb up and hop over to the ladder just to your right and climb into the next screen. Climb to a safe perch and wait for more of the green pods to appear from the bottom and top of the screen. Tend to them, then climb up to the next screen and pay close attention. See the three lighter blocks that blend in with their surroundings? To the right, you should also see what looks like a blue blaster. That is the magnet beam, and you need it to finish the game. With your Guts ability, clear away the blocks and collect the beam. Now you have a choice as to whether you want to take the left or the right ladder. This time, the left route seems more convenient. Climb into the next screen and avoid the enemies that patrol those platforms as you climb up one more screen. Here, you have to climb another ladder while steering clear of electrical currents. Then the next screen offers more of the same. It also happens to house a red spring enemy, but don't let him distract you. He'll likely just bounce around a bit and then plunge to his doom, without any interference necessary from you. Climb up into the next screen and press to the right. You'll find another wide abyss, with blocks arranged in the same position as those you encountered at the previous abyss. It all feels strangely familiar. Then you can climb into the next screen. Now you must hop along a couple of the transistor boxes, just after the electricity (briefly) vanishes. 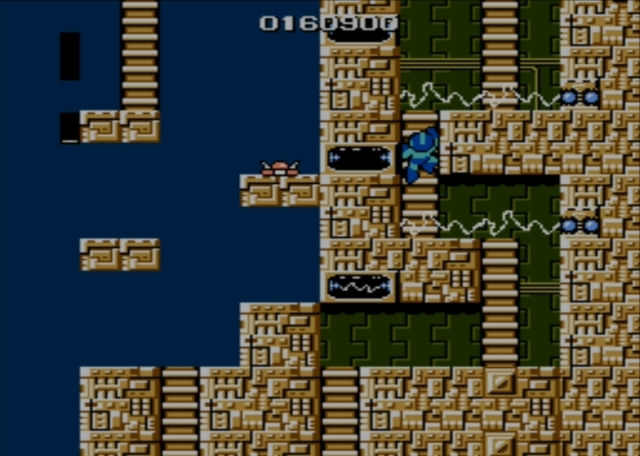 You will reach a ladder that leads to a higher ledge where a red enemy is waiting to the left of a gate. Ideally, you can wait until he hops and dash under him, then pass through the gate. 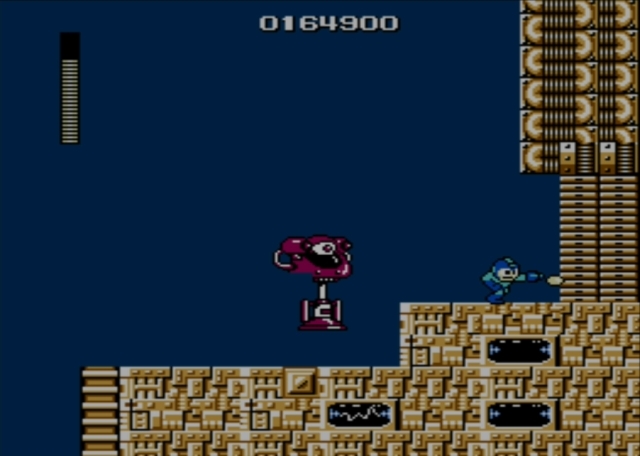 Climb more ladders (while avoiding more electrical currents) to reach the area boss encounter. Finally! If you're stuck using just the arm cannon, you're in for a grueling battle that may well be the most difficult of the initial six. Though Electric Man is ridiculously good at shrugging off attacks from your arm cannon (they barely harm him at all), he's not so good at resisting the power of Cut Man's blades. Hit him with a handful of those and the fight is over almost before it begins. 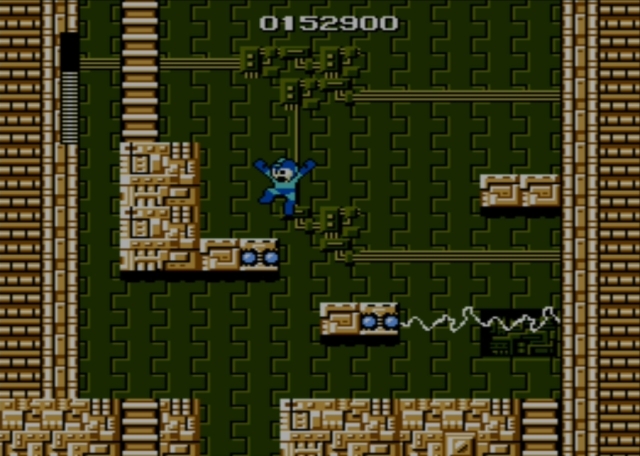 Otherwise, you'll have to avoid electrical shots (jump quickly to avoid the first one that he fires almost immediately after the battle begins) and the robot master himself, both of which do hefty damage. 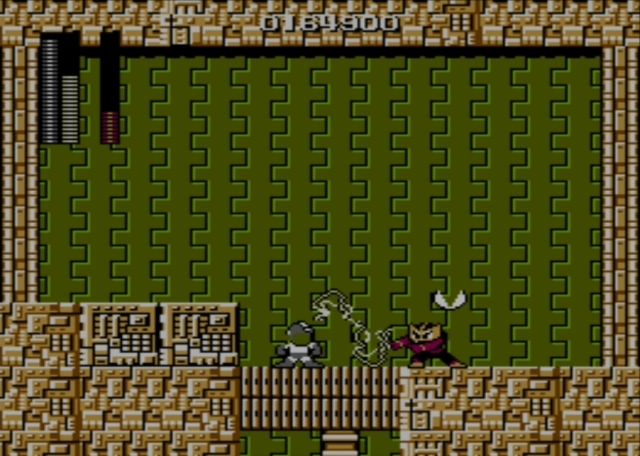 Though there are blocks in the room that suggest the Guts ability will be your friend, that proves to be a false hope.